Starting today, all Eversave members will receive a $10 Save Reward credit to use toward any deal at Eversave through midnight on Thursday, August 25. It’s all part of the millions of dollars in Save Reward credits the popular daily deals site Eversave is giving away during it’s Member Appreciation Event. 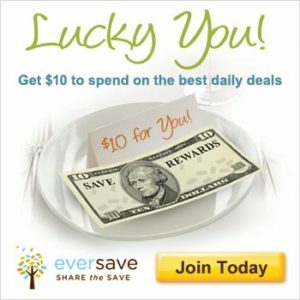 It doesn’t matter if you’re new to Eversave or are already a member – everyone can get this credit. The catch: You have to use your free $10 credit by midnight on Thursday, August 25. Eversave is just one simple way you can stretch your budget. You’ll find great local and online deals on everything from auto care to travel to restaurant meals. Just $36 to convert old photos to digital form at PhotoBin.com (a $99 value). Spend $15 for $30 worth of environmentally friendly books, bags and gifts from LittlePicklePress.com. And don’t forget to enter my giveaway to win $25 to spend at Eversave!